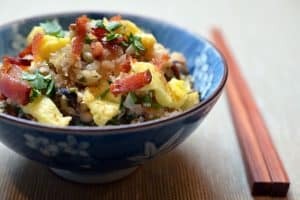 Looking for a Whole30-friendly Asian Cauliflower Fried Rice that will rival whatever you’d order at your favorite Chinese takeout joint? Make this dish! Traditional Chinese fried rice is basically a dish made from leftovers you have rotting in your fridge, which makes dinner prep a breeze. Dice or chop everything small and uniform and your actual cooking time will only be 10-15 minutes. 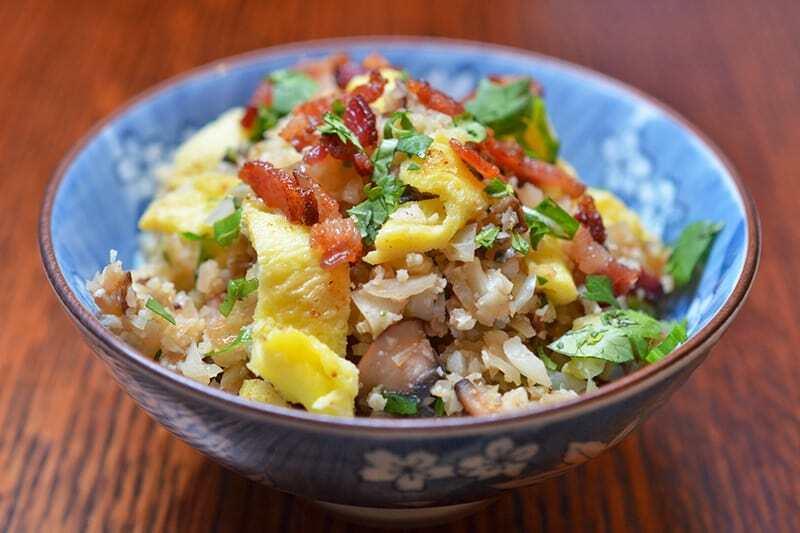 To make my cauliflower fried rice more “Asian,” I added bacon, scrambled eggs, minced ginger, sliced green onions, chopped cilantro, fish sauce, and coconut aminos. Okay, the bacon part isn’t Chinese but it’s intrinsic for the dish. Feel free to change up this recipe by substituting whatever you have lying around. Try adding some leftover meat to make a complete, one-bowl meal. Wanna make this dish even faster? Buy riced cauliflower! I stockpile frozen cauliflower rice and throw it in straight from the freezer. You may need to cook it a minute or two extra, but that’s the only difference. If you thaw it first, the cauliflower rice will be soggy and mushy. Where do you find Whole30-compliant bacon? There are lots of brands these days! I buy Wellshire Farms, Applegate, and Pederson’s sugar-free bacon. 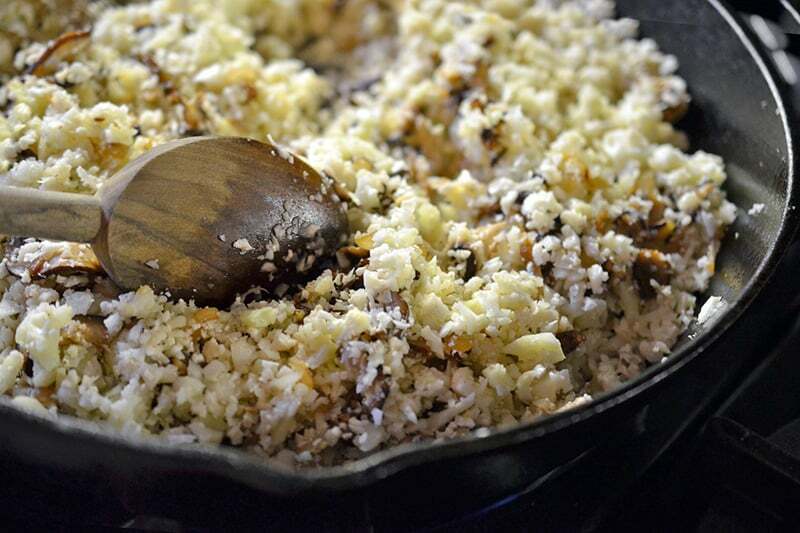 Use ¼ cup of my All-Purpose Stir-Fry sauce in place of the coconut aminos, vinegar, and fish sauce to season the cauliflower rice. Substitute any leftover cooked protein for the bacon! I routinely use leftover roast chicken, ham, or Paleo Char Siu (Chinese Barbecue Pork) in place of the bacon. No leftover protein, no problem! Just increase the amount of scrambled eggs in the dish. Leftovers freeze well and can be stored in the freezer for up to 2 months. You can also store it in the fridge for up to 4 days. Craving a spicy and tangy variation? Make my Kimchi Cauliflower Fried Rice! 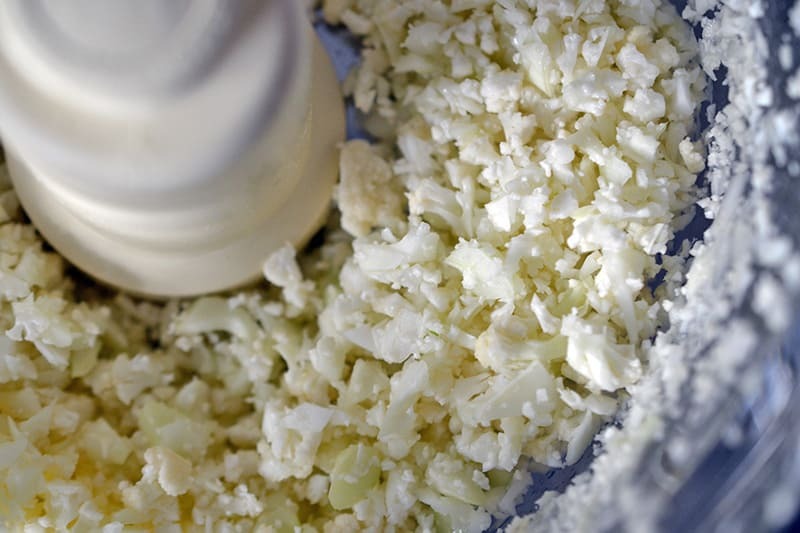 Pulse the cauliflower florets in a food processor until the pieces resemble rice or couscous. Toss the diced bacon into a large cast iron skillet over medium heat and fry until the bits are crispy. While the bacon’s cooking, whisk the two eggs in a small bowl with some salt and pepper. 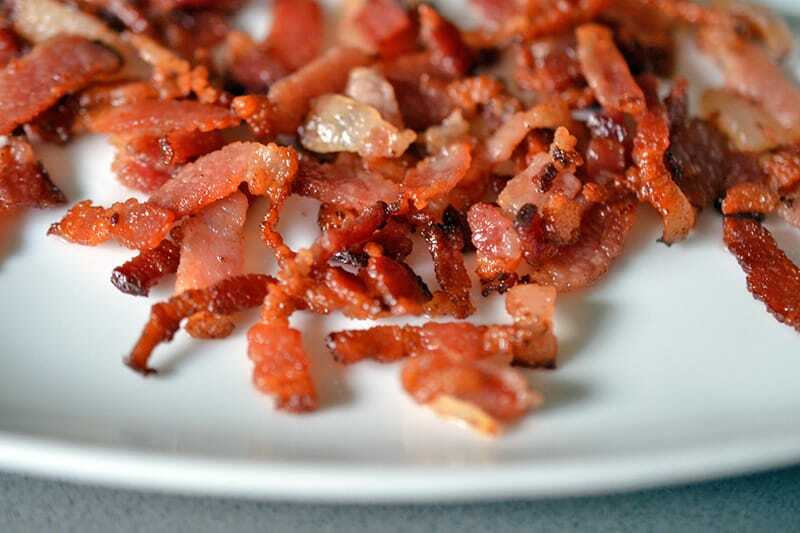 When the bacon’s done, remove the crunchy swine to a separate plate with a slotted spoon. Pour the whisked eggs into the hot bacon grease and fry a thin egg omelet, about 2 minutes on one side and then 30 seconds on the other side. Transfer the egg omelet to a cutting board and slice it thinly. Set it aside. 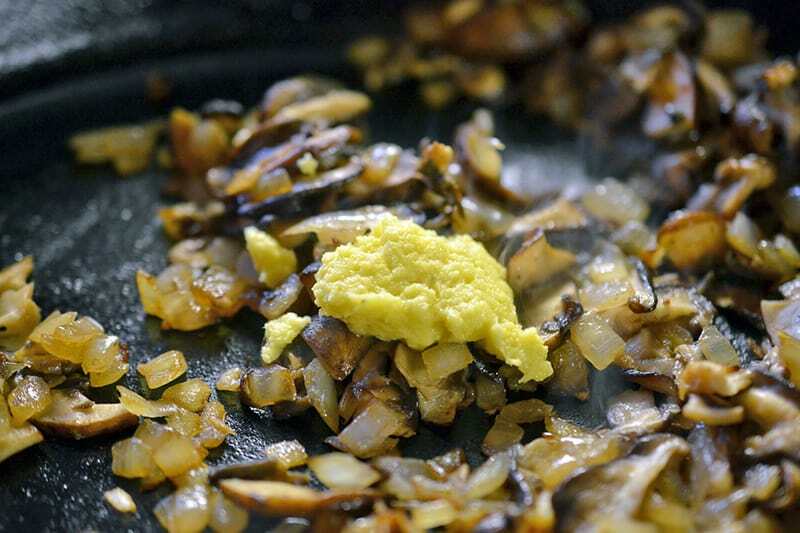 Crank up the heat for the cast iron skillet to medium-high heat and add the chopped onions (along with a dash of salt and pepper). 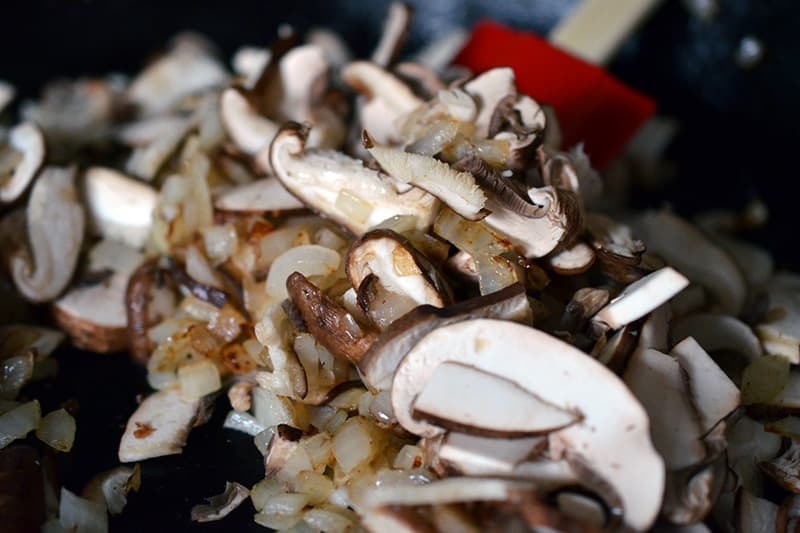 Once the onion soften, toss in the sliced mushrooms (along with yet another sprinkle of salt and pepper) and stir-fry everything until the mushroom liquid has evaporated and the ‘shrooms have browned a bit. While the ’shrooms are cooking, grab your ginger. I always keep a large knob of ginger on hand in my freezer because that way I’ll always have it handy. When I need to use it, I take it out of the freezer, peel off the skin with a vegetable peeler, and microplane it. It’s almost like making ginger-flavored shaved ice. When the mushrooms are cooked, add the ginger and stir it around for 30 seconds or until fragrant. 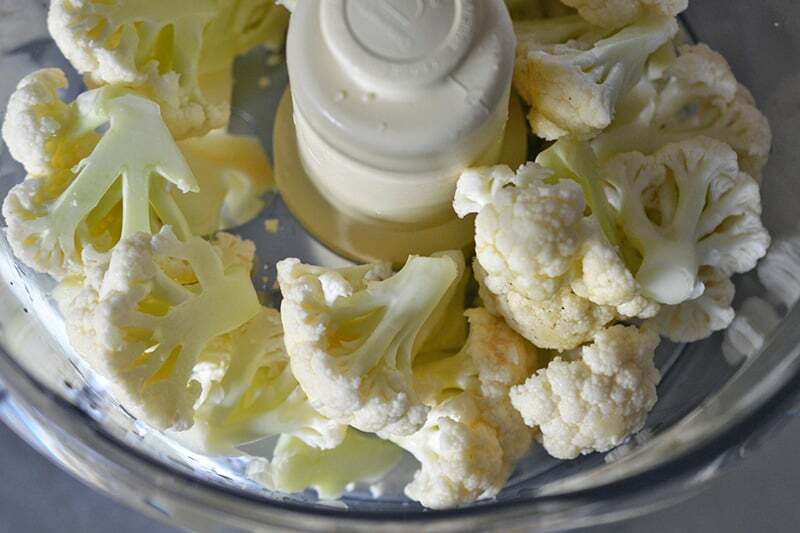 Toss in the cauliflower and even more salt and pepper. 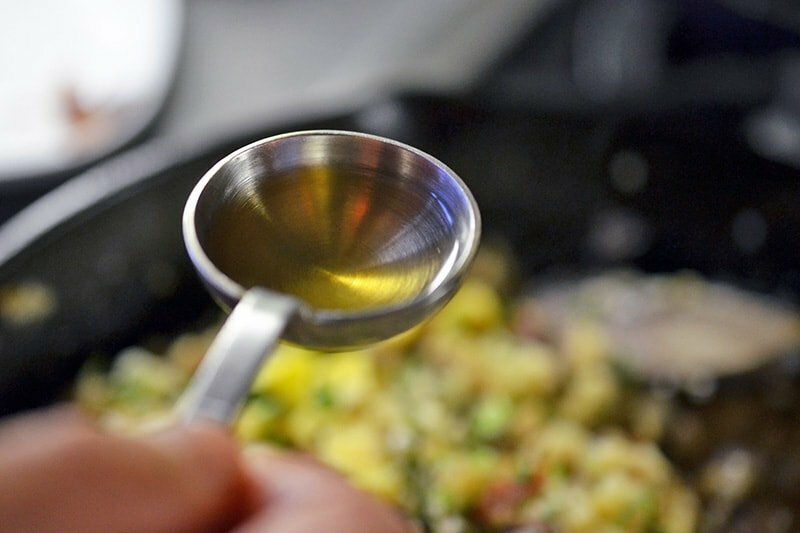 Place a lid on the skillet and lower the heat to low and cook it covered for about 5 minutes. 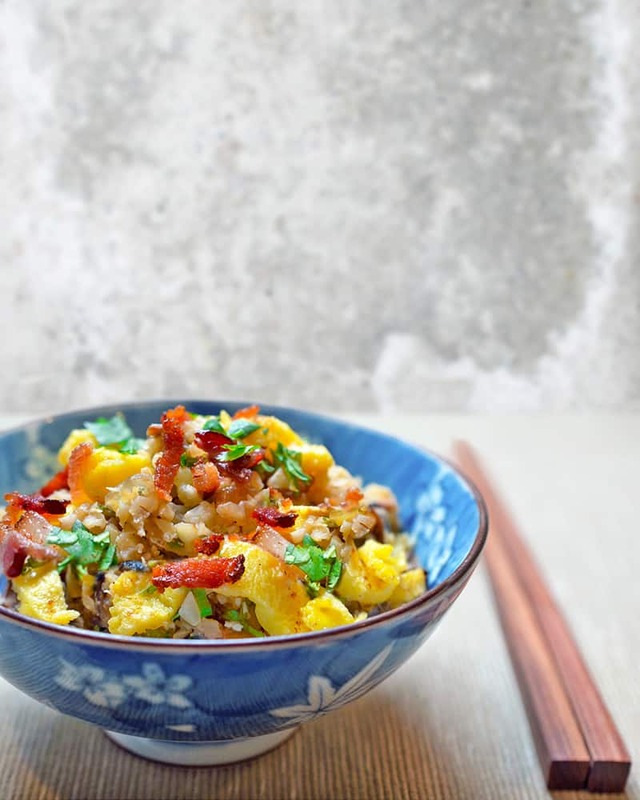 When the cauliflower’s tender (but not too mushy), add the coconut aminos, the herbs, and the sliced egg omelet. You can also add a little coconut vinegar to add a tiny bit of tang to the dish. And splash on some fish sauce for good measure! Taste for seasoning and adjust if necessary. Before serving, I toss on the reserved crispy bacon bits. Voila! 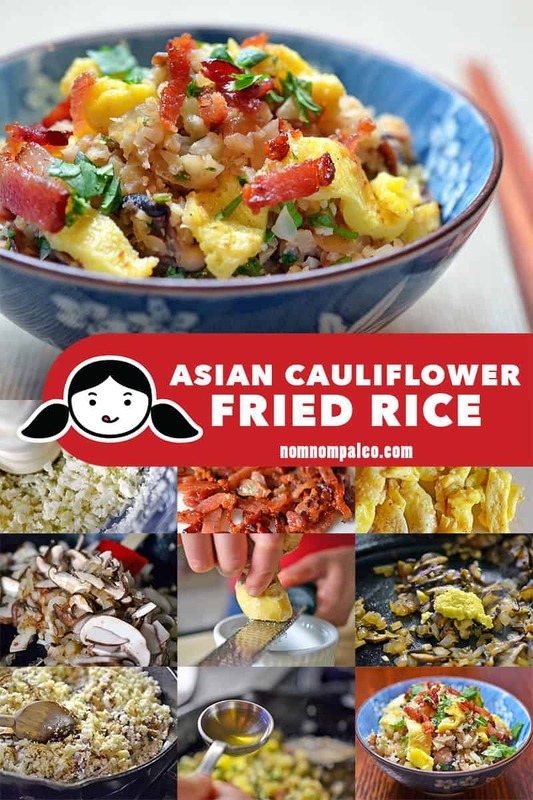 Looking for a Whole30-friendly Asian Cauliflower Fried Rice that will rival whatever you'd order at your favorite Chinese takeout joint? Make this dish! While the bacon's cooking, whisk the two eggs in a small bowl with some salt and pepper. 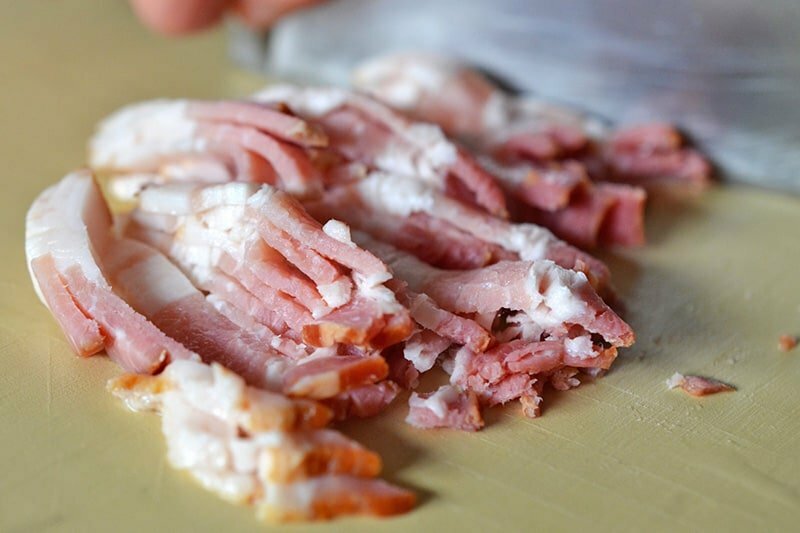 When the bacon's done, remove the crunchy swine to a separate plate with a slotted spoon. Crank up the heat for the cast iron skillet to medium-high heat and add the chopped onions (along with a dash of salt and pepper). Once the onion soften, toss in the sliced mushrooms (along with yet another sprinkle of salt and pepper) and stir-fry everything until the mushroom liquid has evaporated and the 'shrooms have browned a bit. While the 'shrooms are cooking, grab your ginger. I always keep a large knob of ginger on hand in my freezer because that way I'll always have it handy. When I need to use it, I take it out of the freezer, peel off the skin with a vegetable peeler, and microplane it. 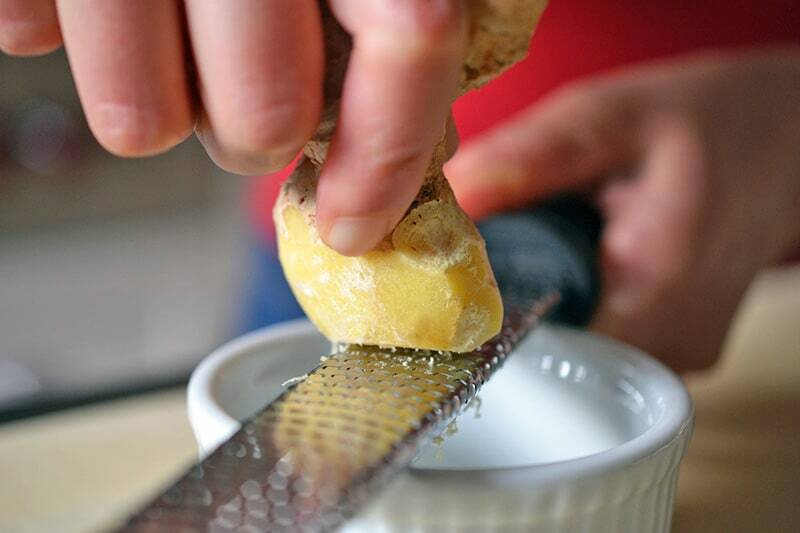 It’s almost like making ginger-flavored shaved ice. When the mushrooms are cooked, add the ginger and stir it around for 30 seconds or until fragrant. Toss in the cauliflower and even more salt and pepper. Place a lid on the skillet and lower the heat to low and cook it covered for about 5 minutes. 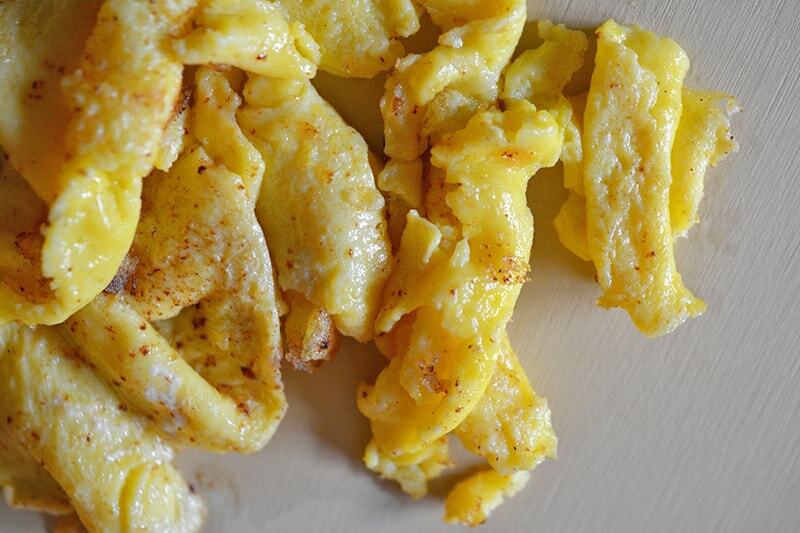 When the cauliflower's tender (but not too mushy), add the coconut aminos, the herbs, and the sliced egg omelet. You can also add a little coconut vinegar to add a tiny bit of tang to the dish. And splash on some fish sauce for good measure! Taste for seasoning and adjust if necessary.